The Natalia Emmanuelle Chaya Foundation has been created in honor and celebration of a life cut too short of a beautiful and brave little girl named Natalia Emmanuelle Chaya. An extraordinary human being taken from this world at only the tender age of two, Natalia possessed wisdom beyond her years and a capacity for receiving and giving love to everyone and anyone which was parallel to none. Natalia is and forever will be loved by all who know her. Natalia radiated a sweetness and charm that always made you smile and filled your heart with an overflowing of joy whenever you were in her presence. 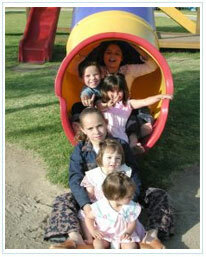 When playing with her friends, she loved to be helpful, cooperative and compassionate with others. During times of hardship, Natalia exhibited a fortitude for strength and an exemplary will. As her family and friends, we are blessed to know her and have had the opportunity to experience her special and rare essence. The foundation bears her name because it embodies the ultimate direction of our mission and the real meaning of Natalia's existence which has given us a feeling of being touched by something holy and pure. Translated into Hebrew, Natalia Emmanuelle Chaya represents "Rebirth", "G-D is with us" and "Life". We aim to give this same spiritual lift to others with the creation of this foundation. Natalia's amazing legacy of love and boundless spirit will carry on through her loved ones who will take on the task of helping special needs children and the less fortunate. We will learn from the abundance of lessons that our beloved Natalia has taught us about life and implement our newfound knowledge into positive outlets and avenues in hopes of changing the lives of others' for the better. We hope to engender a real difference and in the process, make our Natalia proud!